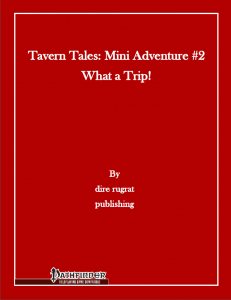 This tavern tales-mini-adventure clocks in at 6 pages, 1 page front cover, 1 page editorial, 1 page SRD, 1 page back cover, leaving us with 2 pages for the adventure. …and this is as far as I can go sans SPOILERS. Potential players should jump ahead to the conclusion. All right, only GMs around? Great! So, a show’s approaching and Marlowe’s nervous…but more so is Cerulean, who has forgotten his bag of shrooms at home…and, dude, they totally help him mellow out and see the music, ya know? Unable to leave, he hands the PCs the keys to his house and asks them to get his bag o’ shrooms. Alas, Cerulean, while meticulous in some regards, is very forgetful and doesn’t exactly know where he last had them…and his fully-mapped place, well, is not the safest, to put it bluntly. Curious PCs may run afoul an archer bush in the front yard, disturb a none-too-friendly family of raccoons…and may have to contend with a mold slime Cerulean totally forgot to check up on…the thing seems to have grown faster than anticipated… His scatterbrained nature similarly may bring the PCs in contact with intoxicating substances…As a very minor nitpick: I would have loved to see proper drug-stats for Cerulean’s shrooms instead of just using an effect of polypurpose panacea…but that is just me complaining at a very high level. Editing and formatting are very good, I noticed no significant glitches. Layout adheres to the no-frills, printer-friendly two-column b/w-standard of the series. The pdf sports a solid piece of b/w-art for the shrooms and its cartography in b/w is functional. No player-friendly version is included, but considering the simplicity of the house’s layout and the PWYW-nature, that’s okay in my book. Kelly Pawlik’s “What a Trip”, structure-wise, is a low-level fetch-quest…and while that elicited some grumbling from my group, said grumbles quickly subsided during the exploration of Cerulean’s house – the place has a delightfully quirky, playful atmosphere and as a bonus, crafty players can actually complete this little side-trek sans shedding any blood…ehr…sap. It is pay what you want, creative and I’d encourage checking this nice mini-adventure out, even if you’re not interested in Simon’s – this one can easily be used in conjunction with a plethora of places. My final verdict will hence clock in at 5 stars + seal of approval. You can get this mini-adventure for any price you consider fair here on OBS!